Alexander: A 2 year old patient diagnosed with Multi Focal and Multi Systemic Langerhans-Cell Histiocytosis, Alex has clinical visits 5 dys per weekevery 21 days, sometimes leading to hospital admissions due to reactions to the treatments. Benjamin: Diagnosed with Burkitt Lymphoma, at the age of 12, Ben has spent all but one weekend in the hospital throughout the summer. His family has had to put their plans on hold for starting a school on their working farm in Fairfax, VT.
Alison: Alison is six year olds and fighting Peripheral Neuropathy, Immunosuppresion, Low Grade Astrocytoma of Suprasellar Region, and Dienrephalic Syndrome of Infancy. Alison is seen weekly at the Dana Farber Cancer Center in Boston and is closely followed by the UVMMC Pediatric Oncology team. Jayden: This 4 year old is fighting leukemia on a single family income of $6,000 per year. The foundation is supporting their fight by helping to offset the cost of bills. Jacob: A three year old fighter diagnosed with Retino Blastoma. He gets admitted once a month to the hospital for treatment, causing his parents to take time off work, which leads to financial struggles. Cecilia: A two year old patient fighting an Atypical Teratoid Rhabdroid Tumor. She has chemotherapy every other week and in March 2018, her family traveled to Boston for Protein Beam radiation for 6 weeks - both parent had to stop work. Rejos: A high school student diagnosed with Hodgekins Lymphoma 3 months into his freshman year, causing him to forgo playing basketball. Keep fighting and smiling Rejos! Storm: A high school student diagnosed with leukemia in the summer of 2017, Storm has had many ups and downs in his cancer fight - low blood counts that require transfusions and temporary paralysis of one side of his body due to chemotherapy toxicity, to name a few. The foundation sent a grant to help offset medical costs. as well as helping to organize a fundraiser with the Vermont volleyball community which raised over $700 for Storm and his family. You will get on that volleyball court very soon, my friend. Keep fighting and staying #stormstrong! Cole: A Vivacious 13 year old, Cole is fighting Neuroendocrine Carcinoma, which recently progressed, so the foundation helped keep the fighting spirit alive by providing financial support as the family stays in and out of the hospital. Keep up your energy Cole! Estella:Diagnosed with Alveola Soft Part Sarcoma in the Spring of 2017, Estella has had to endure 5 weeks of radiation to prep her body for surgery at Boston's Children's Hospital. The foundation's grant is helping the family pay for general living expenses. We all have our fingers crossed for a successful surgery and speedy recovery for Estella!kin's Lymphoma. The foundation's grant is helping the family with much needed financial assistance since his mother lost her job due to her need to take care of her son. Emmett: At only 5 months of age, Little Emmett is just going with the flow. It is his family that is facing the reality and trying to make Emmett's life as normal as possible, while undergoing multiple treatments for neuroblastoma. The foundation was able to make a donation to the family to help with general living expenses while they commute bewtween home, Boston's Children's Hospital, and the University of Vermont Health Center. 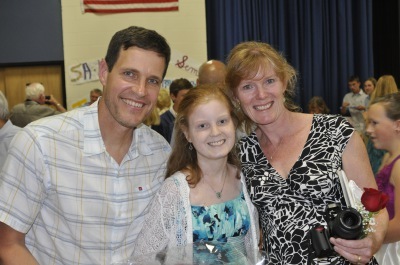 Delaney: A high school student fighting bone cancer, Delaney is one tough girl! The foundation has helped the family with general living expenses while Delney goes through surgery, radiation, and chemotherapy. Gracee: Gracee is fighting Low Thalamic Astrocytoma and unfortunately, recent MRI scans revealed new areas of tumor growth. Her mother and step father are by her side at all times and do not receive sick time. A donation from our foundation will help to cover a few of their expenses. Xavier: Xavier and his mother have been staying at the Ronald McDonald House because of his frequent hospital visits to treat his Hodgkins Disease. We donated money to help cover some of their living expenses. Leandre: Leandre is a 15 year old who is fighting leukemia. He has had one relapse, undergone a bone marrow transplant, and is now having to get various treatments for Host vs Graft Disease. We donated money to the family to help pay for their electrical bill. Garett: Garett is 11 years old and is fighting leukemia. He has to receive high doses of chemotherapy which involves many hospital stays. The Emily M Lyman Foundation gave his family money to help pay the household bills. Rowan: Rowan is an 8 year old girl fighting Wilm's Tumor. She has undergone chemotherapy and will also be receiving radiation as part of her treatment plan. We wrote a check to help Rowan's mom pay for heat during this past winter. Devin: At the age of 15, Devin is fighting leukemia. Traditional chemotherapy did not work for him so he underwent a bone marrow transplant in December 2014. Because Devin's mother has had to stop working to care for her son, the Emily M Lyman Foundation is helping the family pay some of their bills.Stay tough Devin! Dustin: Dustin is 17 years old and is fighting Diffuse Large B Cell Lymphoma. He has to be hospitalized every other week for chemotherapy treatments which impact how much his mother can work.The Emily M Foundation has sent money to help offset some of the family's bills.